Bestop® Bikini®, Windjammer and Duster combo. 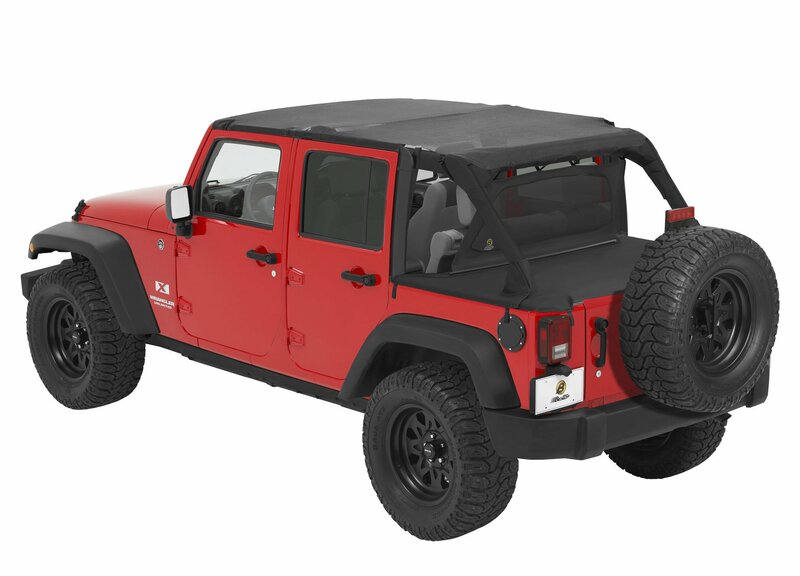 This kit comes complete with the necessary products to quickly install on your 07-09 Jeep Wrangler Unlimited JK 4 Door. Made by Bestop to factory matched colors in original specs material. The Bestop® Header Safari Bikini attaches to your windshield with a special channel that requires no drilling. It also features reinforced edges to eliminate flapping and comes complete with industrial-grade buckles and webbing, and color-matched fabric. Diverts wind, rain and dust from entering your vehicle. Allows air flow while diverting wind, rain and dust from entering cockpit. Helps keep cockpit warm in cold weather. Easily attaches with straps and buckles. Rear deck protection that improves gas mileage and keeps valuables out of sight. To keep your Bestop® Safari Bikini, Duster & Windjammer Summer Combo clean and protected, we suggest using Bestop® Fabric Care for unsurpassed appearance and long life. Must remove the soft top assembly.